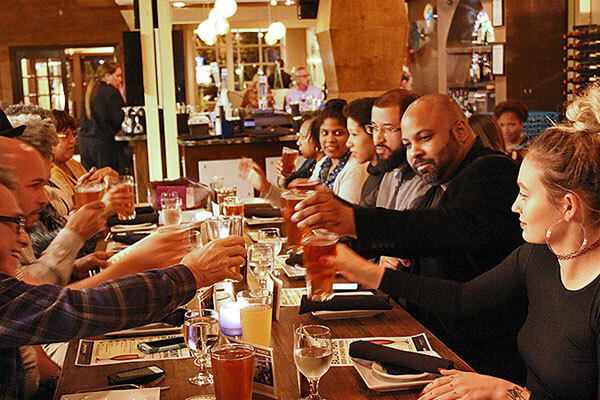 Every Wednesday Night, one pre-arranged local organization will be designated as the “host” group for MOSAIC’s Community Give Back (CGB), during the hours of 5:00 until 9:00 pm in Richmond. MOSAIC Restaurant will give thirteen percent (13%) of the pre-tax receipts from guests who have dinner with us on Wednesday nights (excluding alcohol sales) and mention they are here for the host organization. We are also offering all restaurant patrons the opportunity to donate to that evening’s host organization with a special donation line located at the bottom of all receipts. MOSAIC is dedicated to our community and wants to help inspire as many people as possible. Everyone has a cause that is close to their heart! We are happy to have the opportunity to help provide financial assistance to charitable and community-focused organizations within the area. We hope you will join us in our efforts to support the causes that are most important in our lives. Who qualifies to participate as a host? Still not sure if your cause is eligible? Feel free to contact us to see if your cause can host a Wednesday Give Back in the future: richmond@mosaicedibles.com or call (804) 288-7482. St. Andrew’s School, Pediatric Connections, Comfort Zone Camp, Network of Enterprising Women, Prevent Child Abuse, Senior Connections, American Diabetes Association, Autism Society, American Heart Association, Ring Dog, West End Volunteer Rescue Squad, Virginia Breast Cancer Foundation, and the Gay Community Center of Richmond. No organization is too big or small to participate!!! Be sure to tag MOSAIC in your event posting on Facebook so we can share it with all our followers. Create and/or wear t-shirts/hats/etc advertising your organization the night of your CGB here at the restaurant. Start promoting AS SOON as you book your night. This includes social media sites and your organization’s website. Be sure to tag MOSAIC in your event posting on Facebook so we can share it with all our followers. Start to create/design printed materials and t-shirts for your organization if needed. You are allowed to have flyers and information placed at the host stand, as well as on the bar. We do not allow table-to-table solicitation so the more information and visibility your organization has the more likely you are to have patrons come and ask you about your organization and hopefully decide to support you that night. Continue to promote on your website and social media sites. This is KEY promotion time, as this is when people will be making their plans and finalizing them!! Get the word out to your churches, PTA’s and other groups you may belong to. Remind those who may not have heard about your event- neighbors, family members, etc. Have those that are interested in coming make reservations for the night of your CGB. Ensure your printed materials and t-shirts will be ready for your event. Continue to promote on social media sites. Promotion is the key to having a successful CGB. It is critical to let people know that you are participating in this event—especially since patrons must tell their server they are here for your organization the night of the event. Arrive around 5:00 pm at the restaurant with your printed materials, t-shirts, etc. Above all else, have a fun, spread the word about your organization, and enjoy some good food and drinks!! An email will be sent to the organization’s contact containing the total money made by your organization. A check will be mailed to you for the amount that was emailed to you earlier that week. If you are interested in participating again, we ask that you wait 1 month before reapplying. A new application is not needed; please just contact richmond@mosaicedibles.com or call (804) 288-7482. No money will be given to the organization the night of your event (unless patrons write checks directly to your organization for a donation). Food sales and money listed on the receipt donation line will be counted after your event. The amount you make will be sent in the form of a check made out to your organization. Table-to-table solicitation is NOT allowed. You are allowed to bring printed materials to the restaurant and wear t-shirts, etc. If patrons are here and unaware of your event, they are more than welcome to decide after reading your materials, to contribute to your cause. Patrons who are here supporting your organization must tell the hostess they are here for your organization in order to have their checks flagged for contribution. Tabletop frames are available and can be placed on each table during the event containing information about your organization. These frames will be 4″ x 6″ in size. If you have marketing materials this size, approximately 25 of them will be needed. We ask that you send those or bring those to the restaurant by 5:00 pm the night of your event. It is the organization’s responsibility to provide marketing materials for the event. A special donation line will be at the bottom of all receipts, so please remind everyone here supporting you that they are able to add any amount to their check and 100% of this amount will be donated to your organization. Please note this is a DIFFERENT line than the tip line for the server. We do not allow any type of presentation that may interfere with the dining experience of patrons who may not be here supporting your cause (this includes speeches, use of microphones, etc).